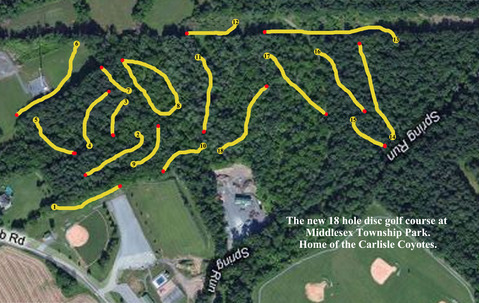 The Cumberland Valley Disc Golf Association (CVDGA), in partnership with the Middlesex Township Recreation Department, is installing an 18-hole disc golf (DG) course at the 127-acre Middlesex Tonwship Park. The game of disc golf is played with similar rules as ball golf. The object of the game is to complete each hole by throwing your disc into the basket in as few strokes as possible. The par for each hole is based on the difficulty of the hole and distance. Most holes will have a par of 3 but some more demanding holes and may be a par of 4 or 5 strokes. Disc golf is played with Discs (Frisbees is the old-school name) that are uniquely designed for drives, mid-range throws and putting.The disc material is highly durable plastic and varies in weight and profile. The distance for each hole is measured in feet with holes ranging from a few hundred feet to over 500 feet from tee to basket. The player with the least amount of strokes tallied for the 18 holes would win. The CVDGA is a volunteer group of local disc golf enthusiasts. The primary designers of the course are Steve Alspaugh and Bill Ledgett but many others have contributed to the effort of constructing the course. We have enjoyed contributions from other local disc golf clubs in the area in terms of both their experience and labor. Also a local volunteer organization, Diakon Wilderness Center, had volunteered their time to course construction. Disc golf is a community sport for all skill levels to play and is a good way to enjoy a “walk in the woods”. Disc golf is a “GREEN” sport with low environmental impact and higher utilization of the park resources for more vibrant park system.